It’s been a while since my last post, I mean who has time when you’re working full time and have an one year old to look after. Anyway, we took our baby boy on a trip to Asia earlier and this was one part of it (hopefully I’ll find time to write the others). Business/First class and top tier OneWorld travellers are spoiled for choice when it comes to lounges at HKIA, Cathay alone runs seven lounges (including one by Dragon Air and an arrival lounge), and OneWorld members have the option of the newly refurbished Qantas Lounge too. On our trip we chose The Bridge Lounge in the West Concourse near gate 35 as it was the closest to our gate. Designed by internationally acclaimed architects Foster + Partners, the lounge exudes an understated luxurious and warm ambiance. A good selection of hot and cold Asian and Western dishes are available from the self-service food station and plenty of dining seating that lets you eat at the right height instead of having to bend over a small lounge table. If you’re after a lighter alternative, then there’s the cafe at the back of the lounge serving fresh pastries, cakes and freshly brewed coffee. Don’t feel like eating, no problem. The lounge offers a good mix of individual and group seating areas with a great outlook onto the tarmac, array of newspapers and magazines, and a TV lounge too. Powerpoints are readily available throughout the lounge but you’ll need a universal adapter if your gadget is not from Hong Kong. The IT Zone features a number of Macs plus printing facilities for those that don’t have their own device. More commonly for anyone serious about catching up on work, they can park themselves and their laptop in Cathay’s hallmark and custom-made Solus chairs offering a self-contained working space. 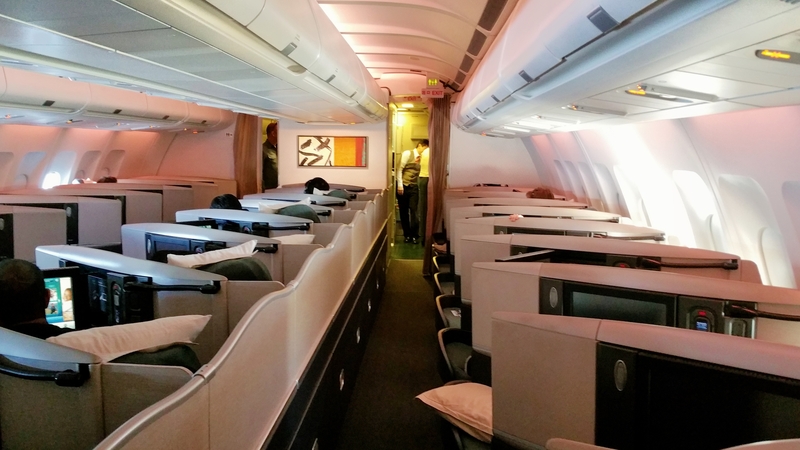 Cathay Pacific has 11 A340-300s in its fleet offering three cabins (Economy, Premium Economy and Business). There are 26 Business Class seats in a 1-1-1 layout on board and 11 A and K at the front are the two bassinet seats. There’s a wall between the middle seat (11D) and 11K so if you’re travelling as a couple + baby, it’s best to take 11A and 11D. The fully lie-flat seats offer plenty of room for an adult plus a bit of room for the little one to play around when the seat isn’t in a flat position. Cathay offers a great on-demand IFE with heaps of movie, TV series for its passengers (though trying to watch a movie in one go with a little one is impossible). Bassinets can be reserved at the time of booking and can fit a baby up to 12Kgs, more information from Cathay can be found here. Once the plane reaches cursing altitude and the seat belt sign goes off, your air attendant sets up the wonderful bassinet. As wonderful as it is, chances are unless your baby is still very young, not mobile, or asleep, they’re not going to want to be stuck there the whole flight so having that extra space for them to play around on the ground (in your seat) is perfect. Somewhat annoyingly, when the seat belt sign goes on, even if your baby is sound asleep , you have to take them out and put them back on your lap and risk waking them. Obviously safety comes first but on some other airlines like Malaysia Airlines, the bassinet comes with a seat beat so you don’t have to take your baby out unless it’s take-off/landing time. Now changing diapers at 37,000ft in those tiny airplane bathrooms is quite a squeeze especially when there’s a sloping roof, so it’s good to know that newer planes like the 787-9 sees larger bathrooms. The flight attendants are absolutely brilliant and tries their best to make sure baby and parents have a comfortable flight. They even took care of our baby boy so we could have a break and played with him throughout the flight. Apart from pre-packaged baby food, Cathay also offers a Mustela baby care pack with nappies and creams just in case you forgot to bring your own. If budget allows (or you have plenty of frequent flier points), flying business class with an infant is definitely worthwhile (especially under 2s generally pay very little in fares – generally 10%), long haul flights is by no means easy but having the extra room and extra care makes a whole world of difference. Overall, from product to service; attentiveness to responsiveness, Cathay was fantastic and we’d definitely fly with them again.